Consumers are organizing themselves to make their voices heard and express their opinions on brands through social networks. Whether the remarks are good or bad (but, of course, especially when they are bad) the court 2.0 is always right. It is then up to the brands to find a way to extinguish the fire. However, with the controversy “Coolest Monkey in the jungle” H&M offered us the bad buzz of this year’s beginning. But what if it’s all about the buzz? 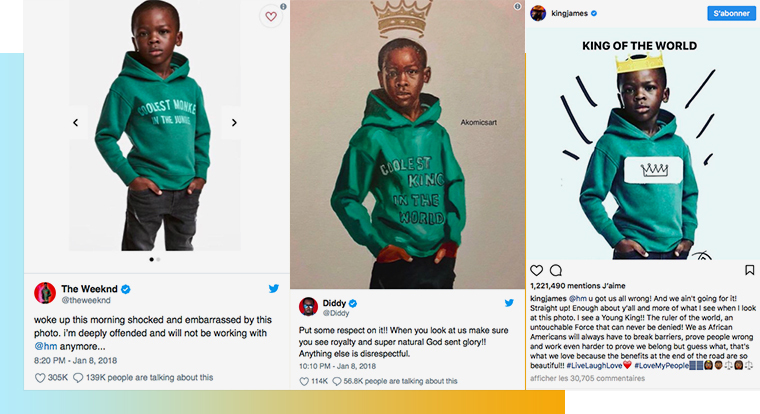 It all started in the early hours of 2018, when Twitter users noticed a green children’s sweatshirt with the message “Coolest Monkey in the Jungle” on the brand’s UK website. 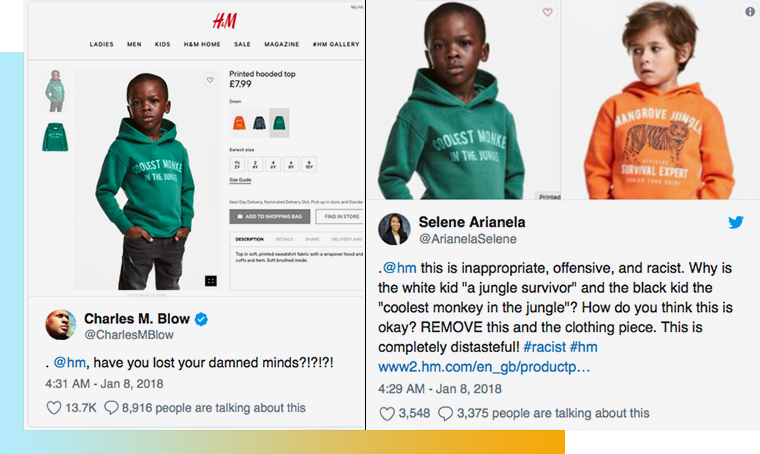 This could have been just a cute piece of clothing, except that the Swedish retailer took a black child as a model, something that Twitter users quickly described as “ordinary racism“. 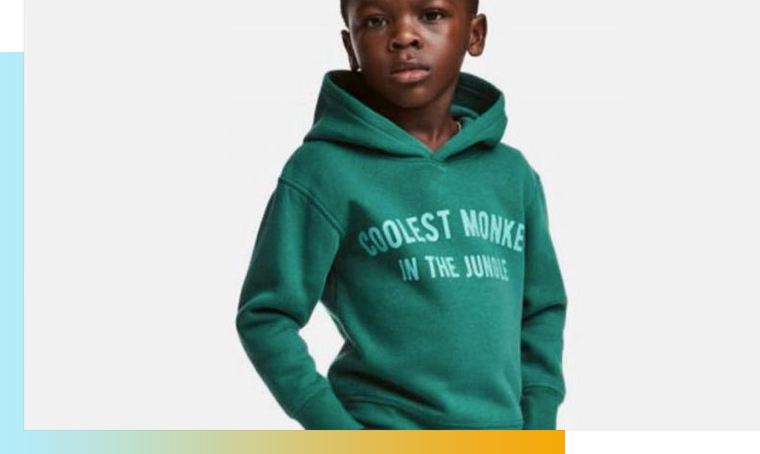 To make things worse, H&M modelled two other versions of the sweatshirt: one with the message “Mangrove Jungle Survival Expert” and the other simply with various jungle animals using a white child. H&M didn’t comment on this point. Anna Eriksson then declared that the image had been “removed from all H&M channels“. But later on, internet users realized that the hoodie was still on sale on the brand’s website in the UK. “We apologize to anyone who might have been offended.” A little light and naive… especially a few months after the Dove brand was also involved in the same type of controversy. The brand’s response was not enough, therefore the controversy swelled very quickly through thousands of users’ tweets and retweets. The court then expanded to its biggest tribunals: the celebrities. Successively, stars such as The Weekend, Puff Daddy, LeBron James or Romelo Lukaku post messages to terminate their contracts with the brand or denounce it’s initiative. The brand no longer speaks, celebrities speak for it. It’s already too late. On Pitchfork:”We understand that many people have been annoyed by the image. We at H&M can only agree. We are deeply sorry that the photo was taken, and we also regret the reactions it caused. As a result, we have removed not only the image of our chains, but also clothing from our global product offering. Bonus Stage: Buzz with bad buzz? What if this is all just a big trick? After a few weeks of contempt, many communicators then wondered whether this bad buzz had not been orchestrated by H&M. Indeed, after a very complicated year 2017, the company’s sales performance was particularly bad on their e-commerce sites. Thus, in order to increase sales and reduce inventories, the company would have been tempted to create and control its own bad buzz to stimulate online sales and increase the awareness of its e-shop. A risky strategy because, by choosing to assume a controversial image in an ephemeral way, H&M would have made the bet to create a peak of traffic on its e-commerce sites in the short or medium term. Machiavellian communication strategy or incredible clumsiness, everyone will have an opinion on the issue… But by playing with codes of gender, race or religion, brands always deliberately venture into a dangerous territory: controversy, where the only law that exists is the law of the jungle.